Packed with more than 350 techniques, this book delivers what you need to know - on the spot. 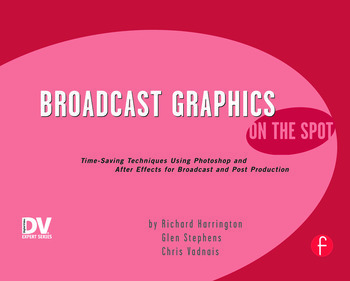 If you create graphics for television, this book is for you. 'Broadcast Graphics on the Spot' show you how to produce more compelling TV graphics. From gathering images for use in broadcast graphics to working with fonts, mastering keying and rotoscoping, or working with logo motion, this book includes step-by-step procedures for creating over-the-shoulder graphics for news anchors, lower thirds, titles, and full-screens that can be used in everyday news productions. A digital video expert and a trained business professional, Rich understands both the creative and management sides of the visual communications industry. He's held such diverse jobs as directing newscasts and publishing music magazines, to managing a production department and consulting non-profit agencies. Rich graduated from Drake University School of Journalism with dual degrees in Broadcast News and Radio-Television Production. He also holds a master's degree in Project Management from Keller Graduate School of Management.